Branding is not a stand alone concept. It is a framework. 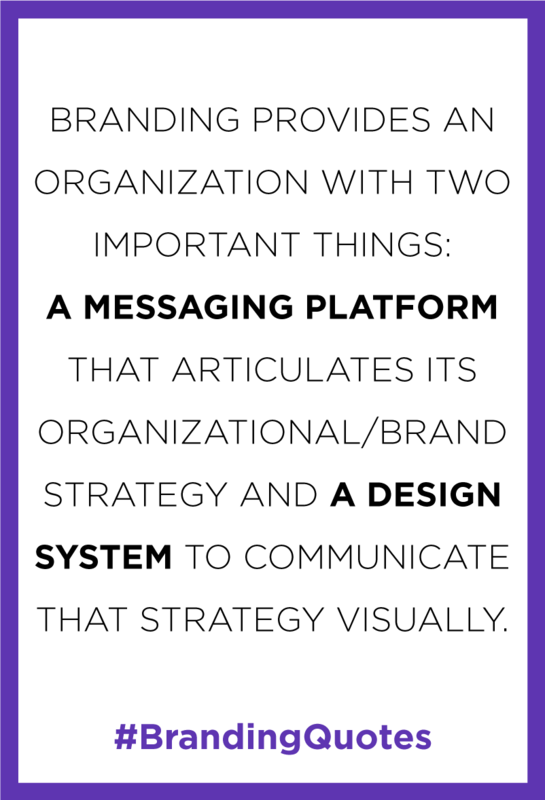 Branding provides an organization with two important things: a messaging platform that articulates its organizational/brand strategy and a design system to communicate that strategy visually. Position your organization in the environments and manner you want, and also in the mind of your audiences. Your Language: This is how you ‘speak’ to all your intended audiences, throughout all channels. This is the nature and aims of visual and written communications used. Design: Design covers how your messages are delivered. The selection of the right tools, and the construction of visual messaging. Experiences: These are the stories, relationships and narratives developed when you combine the language and the design. Cause driven design firms like us invest a of time and energy helping organizations create purpose and alignment across their messaging with their audiences. We build powerful brands by harnessing organization’s mission, values, and strategy to identify all possible actions they should take to communicate and the respective tools to be used. Our clients trust our expertise to develop brand experiences that forge impactful, lasting connections with individuals, partners, and audiences. We always work with a deep awareness of all the ways in which your messaging can be used to convey powerful narratives and stories for your brand. Our branding process is deliberately designed to build your messages, platforms, and the delivery systems required, with emphasis on the visual, which is the language of the times. With that being said, here’s an overview of how we, at Maison Interactive, work to develop the branding framework. All organizations including Nonprofits comprise several smaller units working through their different roles and functions toward their mission. Therefore the first step is to, clarify how all these units come together, and the nature of these relationships. Most of the time Nonprofits tackle difficult social problems, whose impact may be at first difficult to see. Developing a brand strategy is the means through which the Nonprofit’s work can be explained to the audience in a way that has a bigger impact than anticipated from traditional growth models. It also defines the entire brand building process, allowing for proper focus on important elements that are not easy to immediately detect. While developing your brand strategy, all concepts developed should answer the following questions. Mission: Why was your Nonprofit formed in the first place? Vision: What do you hope to achieve? How does it look like when your mission is successfully executed? Challenges: What are the challenges that stand in the your way? Especially challenges in terms of how your Nonprofit is perceived. Theory of Change: What means do you need to employ to achieve your vision? Audiences: Who is involved in carrying out your mission? Who do you receive funding from? Who are your key benefactors? Who do you work with? Values: What are the principles that guide the organization and its people while working to advance its mission? Functions: What are the key activities in which the organization engages? Differentiators: What sets your organization apart? What makes your organization able to carry out its mission? Personality: What’s adjectives would you use to describe your Nonprofit? If your Nonprofit was a person, how would he/she relate to the audiences. What language would he/she use? They say a picture is worth a thousand words. Visual communication unlike with language, which uses the same element (words) to communicate, uses multiple different design elements (including words) to communicate the same ideas, which in turn add greater meaning that words alone can’t create. Most people are familiar with some of these visual brand elements (Logo, Typography, Color, Photography, etc), however their nuances are often less clear to some. Our experience shows that getting you the ‘look’ and ‘feel’ that you want needs a system that optimizes the emotional appeal at all points of contact with your audience, without distorting the core messaging of who you are and what you do. This kind of evaluation not only enables us to design branding that is a more accurate reflection of all the intangible ideas and values that your organization stands for. It also enables us to choose the right tools and channels and keeps us closer to the identity developed during the brand strategy development in all possible contexts. So you want to begin the process of developing your brand, what should you look for in a creative partner? Passion: Use the same passion with which you work to find the best possible partner. Effective brand building takes time, and therefore you want a team that will invest as much time as you, to develop the best possible brand. Look for a partner that believes in what your organization does. That is invested in seeing your work flourish and expand, beyond what they bring to the table. Organization Values: Do both of your organizations value the same things? At Maison Interactive, we have worked with many Nonprofits to help them to develop and finetune their brand development. Here’s a sneak peek to our proven and trusted process, that you can use to countercheck with other creative partners you work with. 1.We love to learn about you and your work, and to partner with you using our skills set. What’s working for you? What needs to be improved? We immerse ourselves in your organization and discover who you are, what you do, who you work with, and where you would like your organization to go. Our brand building is conclusive. We have a team that enjoys asking these questions and playing a role in answering them so you can put your best face forward. Once we have a clear understanding of your goals and objectives, we research your audience. What are their goals and objectives? What are they hoping to gain from working with you? When they look for a solution or service like yours, where do they go and who do they ask? We put our heads together to come up with an Information Architecture (the scaffolding or frame for your brand). We also work out the messaging, how do you want to communicate with your audience? What tools do you want to employ? What messages do you want to tell them? Then our design team begins working on the look and feel of all the different elements. At this stage we usually have a lot of back and forth between our teams to fine tune everything, and ensure that everything communicates what it should. Once we are both happy with the design, and launched your website (if need be), we let all the elements into the wild (so to speak) . We stay on though, to monitor how your audience is responding to the messages that we have put out. If need be, we go back and re-work some of the elements. No. We stick around and make sure you feel comfortable using your new tools. If you have a question, or if something isn’t working exactly the way you like it, or it’s not meeting its intended goal, we’ll make sure it’s working the way you like it. Collaboration is so important to us. It’s important to our clients and to us that we work together as a team. You might not be a design expert, but you understand your organization better than anyone else. To create a brand that portrays the energy and passion behind your organization, we need all of our brains and experiences working together. We don’t give you cookie-cutter solutions. We work with you to design and develop a well-thought-out and adaptable tool. After all your organization will grow and change, your brand needs to grow and change with with it. We would love to hear from you! 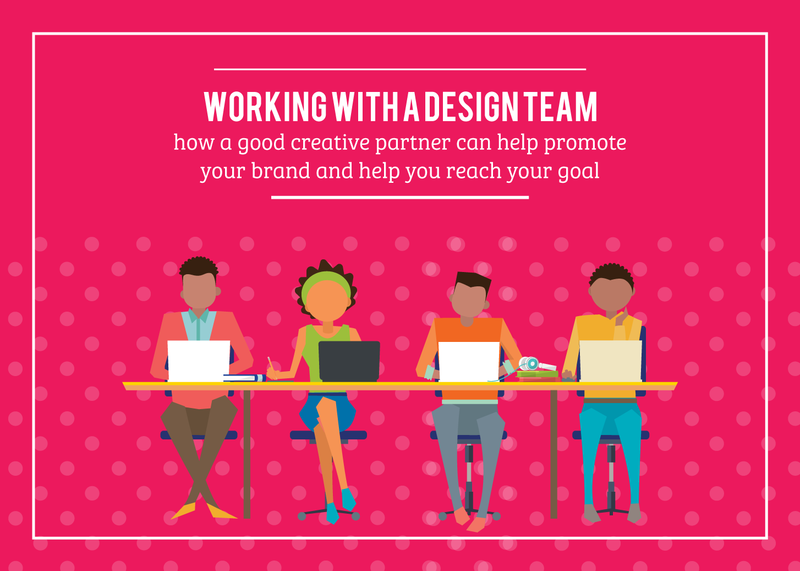 What do you look for in a creative partner? What have been your experiences working with one? Leave us some comments below.